A twisted air-purifier for your home. 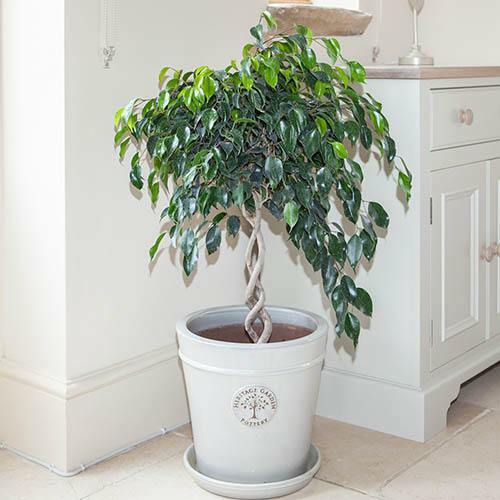 This ornamental fig, with its distinctive, double spiral trunk makes a striking houseplant. Supplied as a mature plant on a double spiral trunk in a 20cm pot. To achieve the beautiful twining stem, two plants have been woven together to create a single, magical spiral trunk with a single lollipop head of leaves. Over time, your plant will get thicker in the trunk but will not get any taller. Not just a pretty face, Ficus benjamina is well known for helping keep the air in your home clean as it filters out pollutants keeping it fresh and clean - according to NASA, weeping figs fight formaldehyde, xylene, and toluene, found in furniture, fireplace smoke, and common household products. Very easy to care for, once you have found the perfect light and draught-free place for your ornamental fig, you can more or less leave it alone to do its own thing. Supplied as a mature plant with a double spiral trunk in a 20cm pot. Supplied as two plants woven together to give a single specimen on a double spiral trunk in a 20cm pot. Once it has the right place, don't relocate your fig as they dislike being moved around.